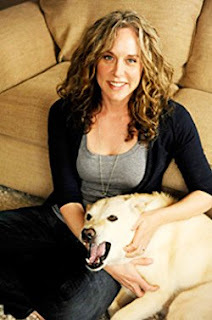 Kiera Stewart is the author of The Summer of Bad Ideas, a new novel for kids. 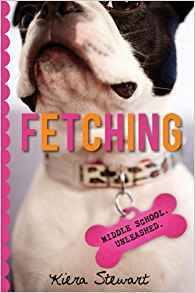 She also has written How To Break a Heart and Fetching. She lives in Sonoma County, California. 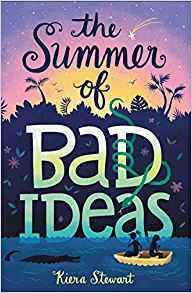 Q: Did you know how The Summer of Bad Ideas would end before you started writing it, or did you make many changes along the way? A: Oh, how I wish I had known! This is something that my editor and I sometimes laugh about (only now), because of the many possible endings I went through. There are plotters and there are fly-by-the-seat-of-your-pantsers, and I definitely fall into the pantser category. Just to give you a few examples, at one point there was a Russian spy thread buried deep in the history in Pinne; at another point, there was a circus thread; and another deleted discovery – a secret marriage! 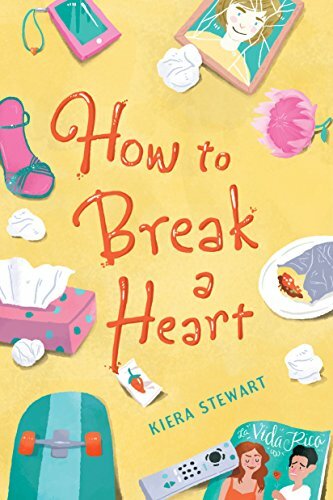 I had just finished writing How To Break a Heart, which is full of telenovela melodrama, and I think I had a hard letting go of the sense of “scandal” when I started writing this book. Thankfully, I had a wonderful, insightful, patient and creative editor on this book (Abby Ranger, who was also my editor with Fetching), and she was able to help coax the true story out of me when I’d write myself into a knot (which was quite often). Q: What does the novel's title signify for you? A: Truthfully, I’m sort of into bad ideas. And I might also have a little obsession with failure. I write a little about this sort of thing in the acknowledgments for SOBI, but here’s what I believe. If you stay on “safe” grounds, you limit your ability to grow. If you strive only for perfection, you’ll stifle your creativity and resourcefulness. Good ideas sometimes lead to bad outcomes, and bad ideas sometimes lead to good outcomes. Obviously, I’m not in favor of outright recklessness (up with safety belts and smoking bans! ), but if there’s a good intention behind that seemingly bad idea and you embrace whatever happens, chances are even failure will mean success. Here’s something that Winston Churchill once said: “Success is stumbling from failure to failure with no loss of enthusiasm.” And I like that. Q: The book takes place in Florida. How important is setting to you, and do you think this could have been set anywhere else? A: This was the first book I’d written where geographic location played a true role. In my other books, I deliberately kept location vague to focus on the ubiquity of the story. But this book was different. The element of the swamp, the tiny-town lifestyle, the heat, and of course the alligator all gave importance to the setting. But of course, readers everywhere should take heart in the fact that bad ideas know no geographical boundaries! Q: Which authors do you especially admire? A: Quite a few, and I’ll try to be as succinct as possible! I credit Katherine Patterson for allowing me to believe I could be an author. She came to my library reading group when I was a child. I loved to read, and I dreamed of becoming an author. Her book had made me cry – Bridge to Terabithia was incredibly moving – but meeting her made me feel so hopeful that I could one day write a book myself. So I’d like to give Katherine Patterson a big shout out for making such a difference in my life. I admire Elizabeth Berg for her being so honest and real, and funny in the way real life often is, and for making me appreciate how vulnerable a character can be. There are many more, but since we’re talking about admiration, I’ll give one more author name, and it’s probably one you haven’t heard of: Chuck Hillig. When I was about 12 years old, my best friend and I read one of his books. I can’t recall the name of the book, but I do remember that it made us question life in new ways and in some way, it had given us a sense of empowerment. She and I both wrote letters to him – that part wasn’t new; we wrote a lot of letters. The difference is that Chuck Hillig wrote back. A REAL AUTHOR (!!!) WRITING TO ME LIKE I MATTER (!!!!!). As a certifiable packrat, despite having moved about 20 times since, I’m pretty sure I still have that letter. It made me feel incredibly special, and it reinforced my dream of writing one day myself. I wanted to connect with readers the way he connected with me. So, to this day, any author who writes back to their readers earns a special mark of admiration from me. A: I’m really excited about my current project. I’ve spent nearly seven months living in Nicaragua for this book about a cross-cultural friendship between two young teens. It’s called My Little Sky – a title that will make sense once it’s done. Though my Spanish is still, well, a work in progress just like the book, it’s been a true adventure! For anyone interested in writing, I’d say never stop finding your story. Keep your mind open and realize that some of the biggest struggles you might go through will actually make you think bigger and deeper so that you can write with perspective and compassion. And never underestimate the importance of that compassion with all your characters when you’re writing, even the icky ones. Be open to input, but only if it helps strengthen your words or your motivation. And don’t listen to the doubters and naysayers (whether that’s from your own head or someone else’s). If you love writing, keep at it. If you love it, but often wonder why the heck you do, stick with it. And ESPECIALLY stay with it if, maybe when trying to write, you find yourself rolling around the floor, in fetal position, staring at dust bunnies, and maybe or maybe not crying. Because if that’s where you are, guess what? It matters to you. So dust yourself off, do something fun for a while, come back to it in a better state, and trust me – when it’s sitting on a shelf in a library somewhere, when it has measurable mass and weight and it closes with a satisfying thud, when it smells of fresh paper and is all dressed up in its stunning and amazing cover, every moment will have been well worth it. Oh, and P.S. Most of the writers I know own decent vacuums.